The City of St. Petersburg is an independent subject of the Russian Federation and its status is specified by the Constitution of the Russian Federation and the Charter of St. Petersburg. 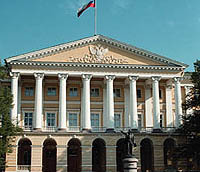 Leningrad Oblast, the area surrounding St. Petersburg, is also an independent subject of the Russian Federation with its own legislative and executive authorities. It is therefore important for anyone embarking on business activities in St. Petersburg to understand that the conditions for operating businesses in St. Petersburg and in Leningrad Oblast may differ from each other. The jurisdictions of the Russian Federation and St. Petersburg are defined in the Constitution of the Russian Federation, a Federal agree-ment and an agreement between the Russian Federation and St. Petersburg. The Charter of St. Petersburg has legal priority over other legal acts of the city, legal acts of St. Petersburg governmental bodies and autonomous local bodies set up in the city Should these acts disagree with the Charter of St. Petersburg, the Charter of St. Petersburg will be effected. Should a federal law published beyond the range of authority of the Russian Federation with respect to matters within joint jurisdiction disagree with a legal act of St. Petersburg, the legislation of St. Petersburg will have priority.